It’s December! Hard to believe there's only one month left in 2011, huh? If you're planning on hosting a holiday dinner, a flavorful prime rib roast might be the centerpiece you’re looking for at your holiday feast. The preparation of the meat is relatively simple and requires no marinating time. The key to success is to measure the internal temperature (135-140 degrees F) to guarantee proper doneness. The cooking time varies and isn't necessarily an indicator of a perfectly cooked prime rib. I wanted to give my prime roast rib an Asian flair, so I seasoned it with kaffir lime leaves, miso paste, red chili powder and fresh ginger. I rubbed the meat with the mixture and roasted it until the thermometer indicated the right internal temperature. You could of course add your favorite flavors here, but I think because of the high quality of this cut of meat, you should stick to the old adage that less is more. 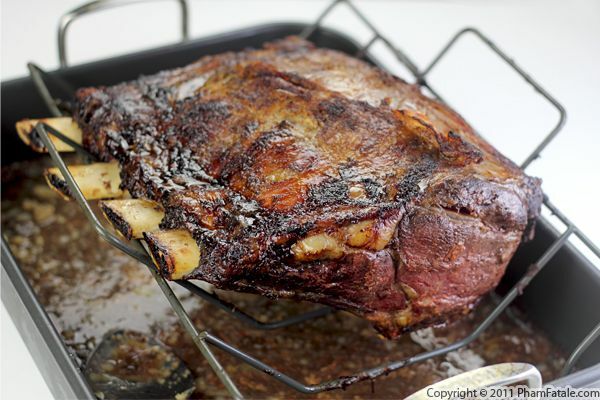 It's a simple, yet very tasty recipe that ensures a succulent and extremely tender prime rib. I finished the dish by broiling the crust for added crispy, intense flavor. It's hard to mess this one up! We’ve done several giveaways this year, and they’ve been a lot of fun. I wanted to do something special for December, and the Advent Calendars (Calendrier de l’Avent in French) of my childhood came to mind. Each day, I would tear open the corresponding day on the calendar box and claim a little present (usually a little toy or a chocolate). It was so exciting! I thought we could count down the days in the same manner and showcase some really high quality products. With that in mind, the 25 Days of Giveaway project was born. We're kicking off the season with La Cense Beef and their Four-Bone Prime Rib Roast, which is exquisitely marbled and oh-so tender. La Cense Beef is grass fed and carries no hormones, no antibiotics, no pesticides and is dedicated to restoring the place of nutrient-dense foods in our diet. 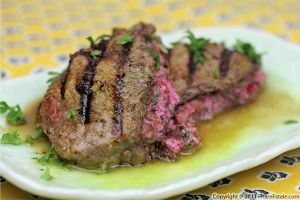 The beef is intensely flavored with an almost natural “herb-y” flavor. You should really give it a try, and if you enter the contest, you just might win one! Can't wait? 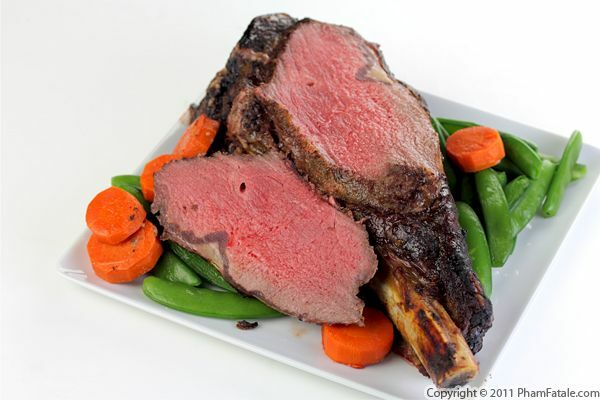 Buy a Four Bone Prime Rib Roast and get 4 pounds of beef burger free! A Pham Fatale Exclusive! Fill out the entry form for a chance to win. Make sure you're a fan of PhamFatale Facebook fan page and La Cense Beef or follow @Phamfatalecom and tweet about this giveaway. 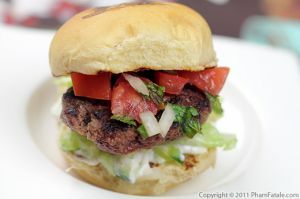 To make it easy, you can just copy and paste this tweet if you’d like: "La Cense Prime Rib Roast #HolidayGiveaway from @Phamfatalecom and @LCBBurgerTruck: http://bit.ly/rz5gbZ". 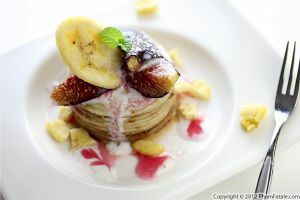 Be sure to check PhamFatale daily, win delicious prizes and find lots more fun things to do. Happy holidays! PhamFatale 25 Days of Giveaways Terms and Conditions: No purchase necessary. All prizes in the 25 days of Giveaways were generously donated by the companies featured. PhamFatale does not accept money or gifts in exchange for these items. The companies featured in 25 Days of Giveaways did not pay to participate in the 25 Days of Giveaways. Winners will be chosen at random, and odds of winning depend on the number of entrants. PhamFatale is not responsible for late, lost, stolen, illegible or incomplete entries which will be disqualified. By entering the PhamFatale 25 Days of Giveaways, you give your consent to the prize-giving company to use your email for future marketing. Only one entry per person per giveaway. Prizes are not refundable or returnable. For the prime rib seasoning: In a mortar and pestle, combine 1 finely chopped kaffir lime leaf, baking powder, miso paste, red chili powder, black pepper, powdered garlic, ginger and paprika. Grind until it forms a paste. Using food service disposable gloves, cover the meat with the seasoning paste. Pour the beef stock in a roasting pan. Tear the remaining kaffir lime leaf in thirds and add it to the beef stock. Place a roasting rack into the roaster. If the rack isn't non-stick, brush the rack with oil using a silicone brush to prevent the meat from sticking. Place the prime rib roast (fat side down) on the rack of the roaster. Cover the pan with aluminum foil. Roast for about 1 hour. Open the oven and place the probe of a digital thermometer in the center of the piece of meat. Cook until the thermometer indicates at least 135°F. The cooking time required this time was 2 hours 35 minutes. Open the oven, remove the aluminum foil and then broil for about 2 minutes to get a nice golden crust. Flip the roast and continue to cook on the broiler for another 4-5 minutes. Remove from the oven. Lightly cover with a sheet of aluminum foil. Allow the meat to rest for at least 30 minutes before carving. That way the meat stays very juicy and tender. Note: Don't discard the pan drippings at the bottom of the roasting pan, I'll post the recipe for au jus very soon. Slice the roast, fanning the slices for a nice presentation; serve immediately with vegetables (I served a sugar snap pea and carrot side dish). 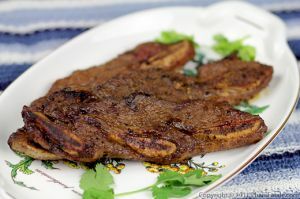 I use baking powder and kaffir lime leaves as meat tenderizers to ensure moist and juicy meat. I used a La Cense 100% grass-fed, Montana Black Angus, four-bone prime rib roast. I placed the rib roast in the oven when it was still frozen. The roast cooks perfectly as you can see in the picture. If you do plan on thawing the roast before cooking, the refrigerator is your safest bet. 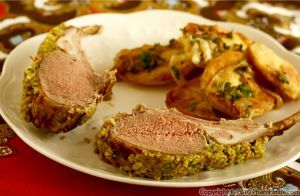 Give the roast plenty of time to thaw and allow to come back up to room temperature before putting in the oven. My husband Lulu planted two kaffir lime trees in our garden. I cook fairly often with the leaves. They're very useful and smell so nice. If you have the space to plant a kaffir lime tree, go for it; it's a good investment if you're into Asian cooking. 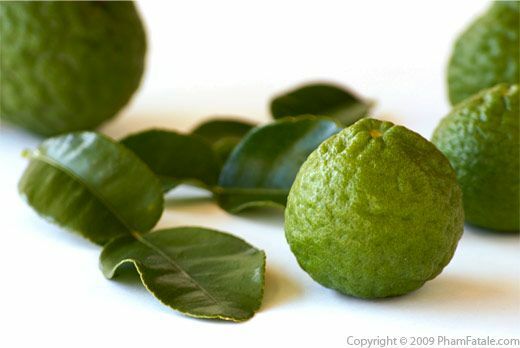 Kaffir lime trees are prized for their fragrant leaves, not their fruits. 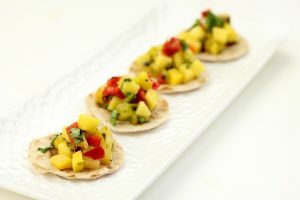 Don't add too much kaffir lime as it tastes very strong and will overpower the dish. You can use the remaining leaves for sweet and sour soups. You can find miso paste in most Asian markets. If you don't have any you can use 1 tablespoon Kosher salt instead. I used Bourbon Barrel brand smoked paprika. You can buy it at www.bourbonbarrelfoods.com. To ensure the juiciness of the meat, I placed liquid at the bottom of the roasting pan. And to keep the Asian theme, I used left-over Vietnamese beef broth that I make in advance and store in the freezer. The roasting time depends on how pink you like the prime rib. If you want to be absolutely sure (and this is my fool-proof way of cooking rib roast), just place a temperature probe in the center of the piece of meat, and remove the meat from the oven when the thermometer registers at least 135°F (you could go up to 140°F, so the meat is less rosy). You can get a digital thermometer at IKEA for a reasonable price. Make sure to let the prime rib rest before slicing it to ensure optimum tenderness of the meat. 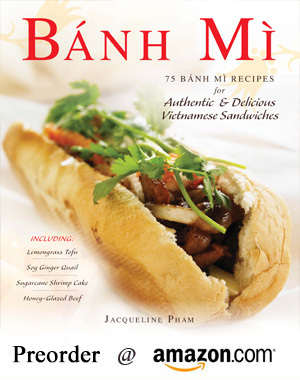 Published By: Jacqueline Pham on December 1, 2011.